The blackout engulfing Venezuela is forcing many to seek refuge — even, as it turns out, President Nicolas Maduro's own relatives. Authorities in neighboring Colombia said the leader's cousin, Argimiro Maduro, along with his spouse, children and extended relatives, approached a border checkpoint leading into Colombia on Monday seeking relief from the power outage. According to officials, the group of 10 complained that the heat was unbearable as the blackout dragged on and said they wanted to spend five days in Riohacha, a city in northern Colombia with easy access to turquoise beaches along the Caribbean Sea. But their plans were dashed when migration authorities found their names on a list of over 300 people with close ties to Maduro who should be denied entry. Photos released by Colombian migration official show the group seeking access in baseball caps and shorts. One man wore a T-shirts with palm trees. Maduro did not comment on the report that his family was seeking access to Colombia, though he has told Venezuelans in statements broadcast on state television that he has been suffering through the blackout alongside them. Colombia's government has recognized opposition leader Juan Guaido as Venezuela's rightful president and recently began denying entry to close Maduro associates as a way of increasing pressure on his administration to hold new elections. 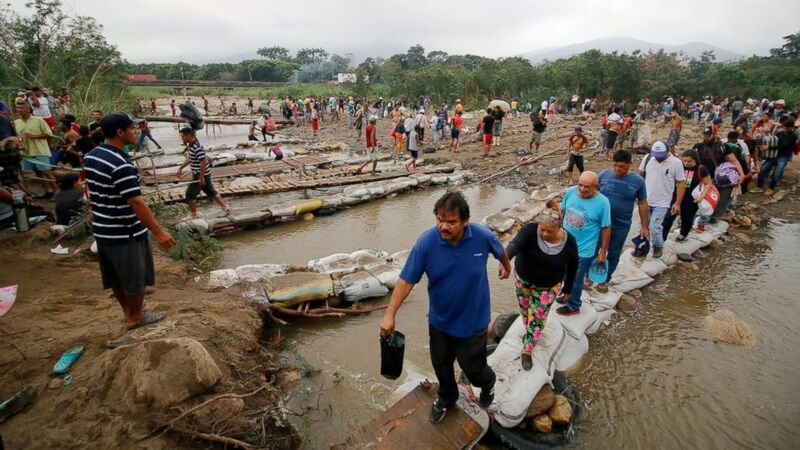 Maduro severed diplomatic relations with Colombia in late February after opposition leaders tried to bring international humanitarian aid collected in the Colombian border city of Cucuta across two bridges into Venezuela. The bridges remain closed except for access to students and patients. Thousands of Venezuelans enter Colombia each day seeking food and medical care and sometimes they come with the goal of leaving permanently. The United Nations estimates at least 3.4 million Venezuelans have fled their homeland in recent years. A power outage that struck last Thursday at the evening rush hour left almost the entire nation in the dark. Venezuela's information minister said Tuesday that the power grid had been almost completely restored, though there were still some pockets reported without power. Venezuelan authorities are blaming the outage on a cyberattack, but engineers with knowledge of the grid's operating system say that was essentially impossible because the computers used have no internet connection and communicate only with each other. Venezuelans have been taking extreme measures to find relief from the outage, parking their cars alongside the road wherever they can find a cellphone signal and collecting buckets of water from the badly polluted Guaire River in capital city Caracas.